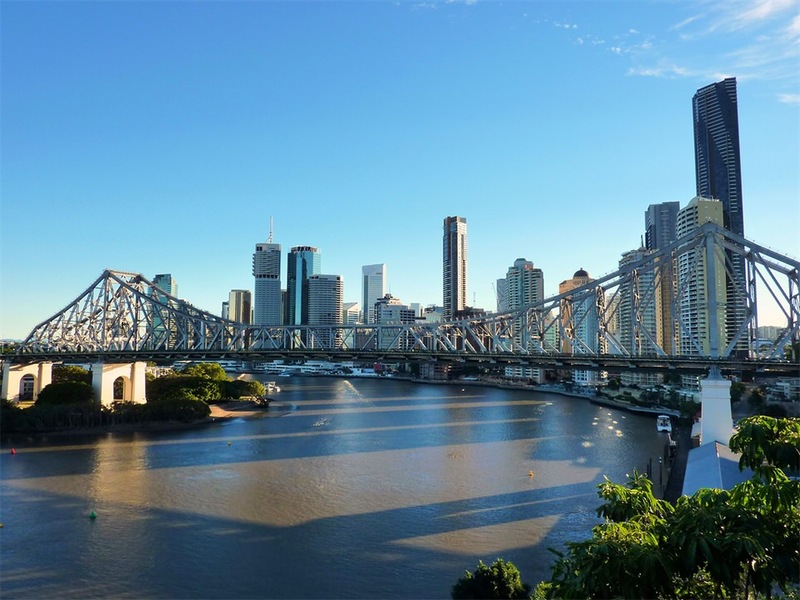 The Brisbane River is the longest in south east Queensland, traveling 344 km from Mount Stanley to empty out into Moreton Bay – also where the Port of Brisbane is located. In its history it has served as a major carriageway of transport. 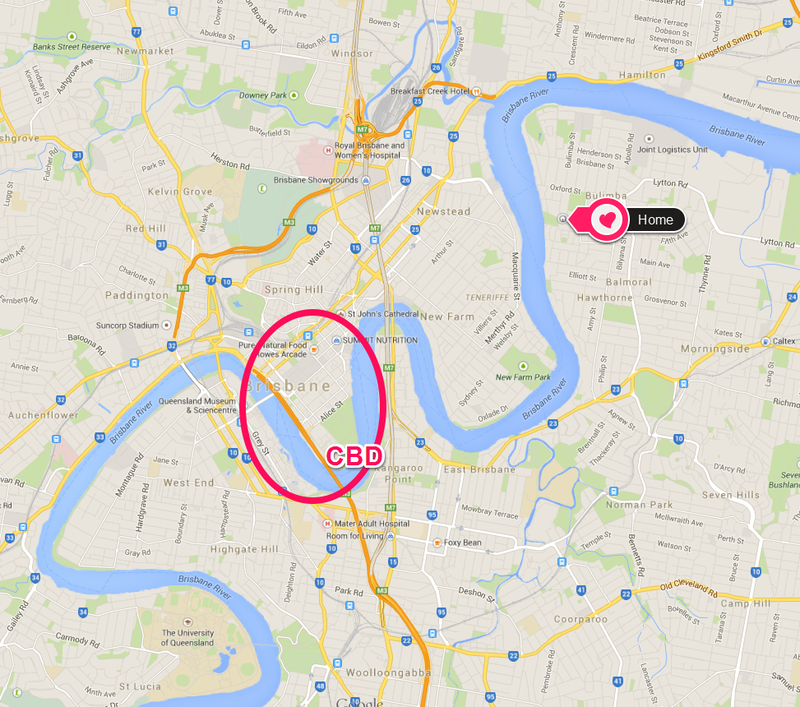 On the map below you can see that we live close to the river in an area called Bulimba. Ed works in the CBD (Central Business District). 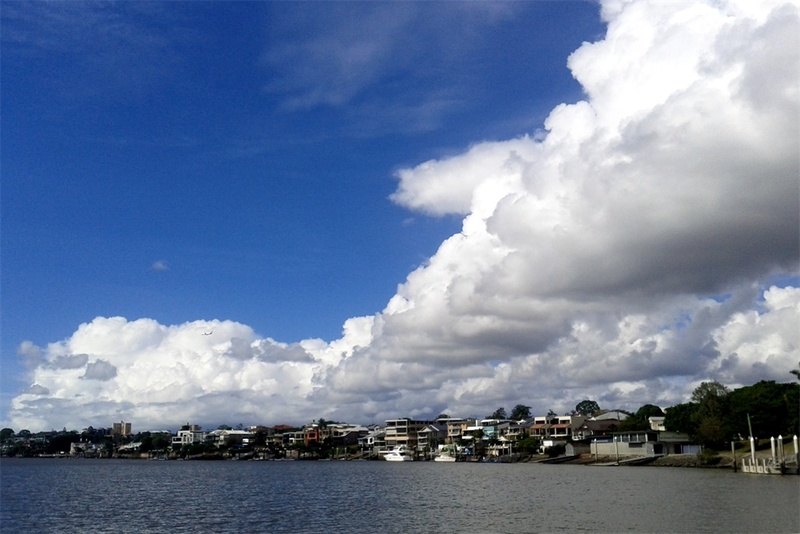 River views – looking downstream from near the CBD. Note the recently constructed Riverwalk on the left side of the photo. Of course if you have a river you need a way of circumventing the river. 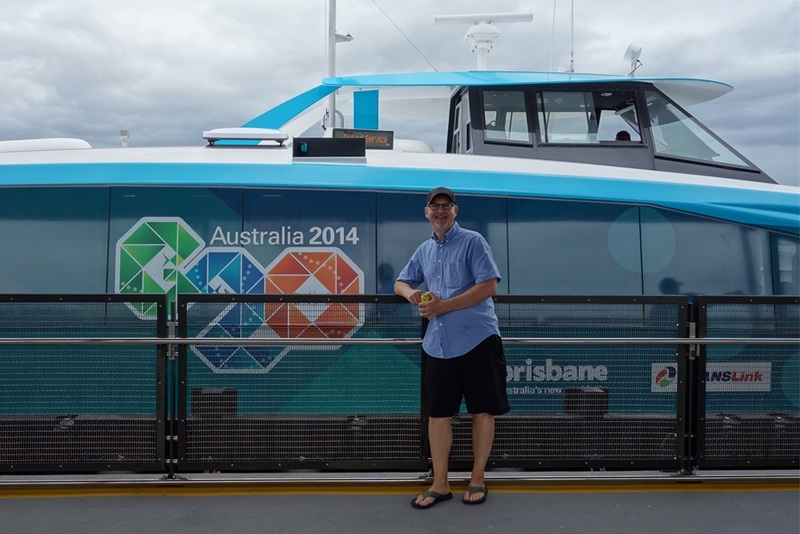 The City Cat Ferry System is used extensively to both cross the river and to travel along the river. 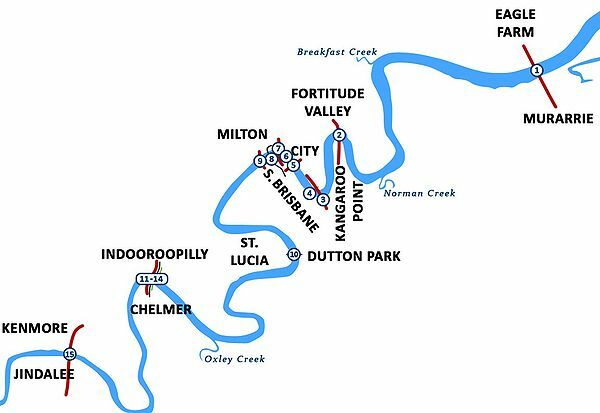 Traditionally bridges are a useful way to cross the river but the majority of Brisbane’s 16 bridges do exist near the core of the city. Although we have not used these bridges extensively, here are some pictures of some of them. 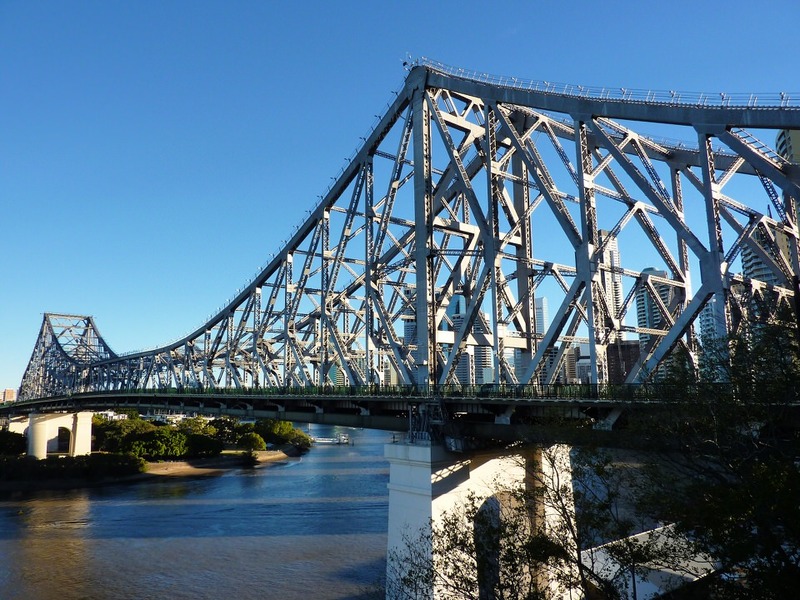 Ed and I live between the impressive tolled Sir Leo Hielscher Bridges and the iconic Story Bridge. 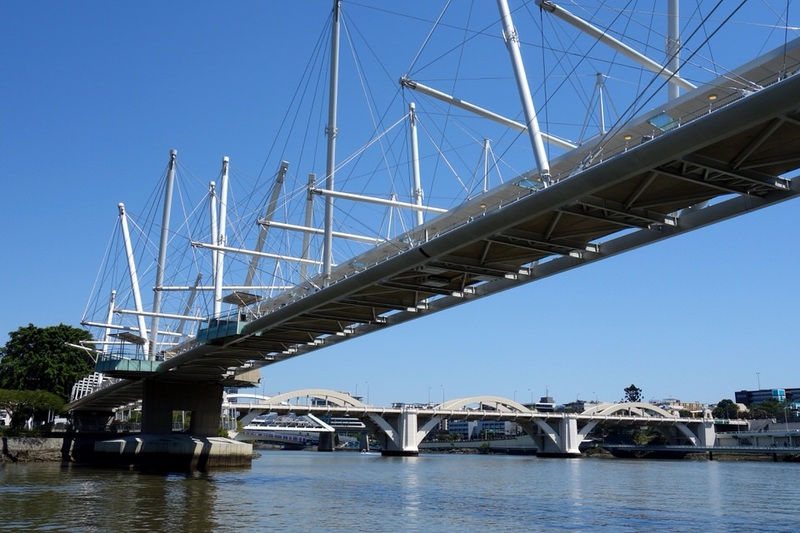 I don’t have any pictures of the Sir Leo Hielscher Bridges, but they are a massive pair (they look like one bridge) with 12 lanes of traffic. They are electronically tolled. I have a Go Via device on the window of my car which records the toll, which is very convenient as I have to cross the bridge quite often. 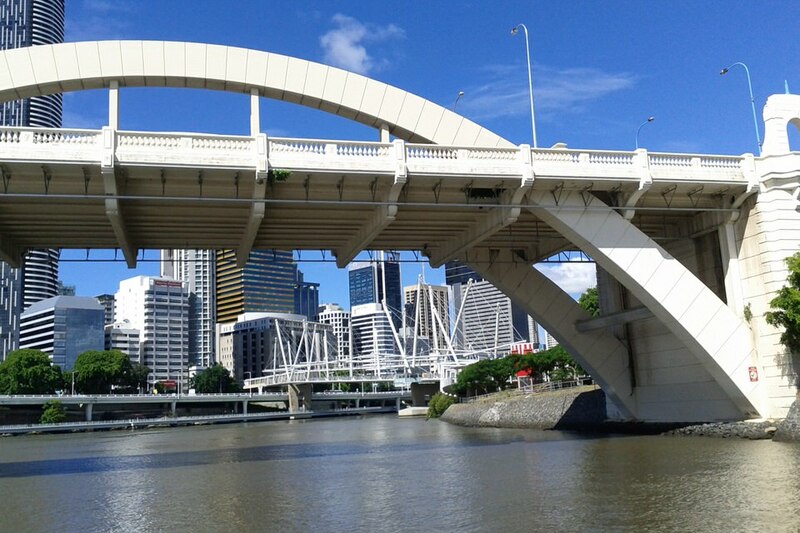 I rarely cross the Story Bridge by car, however I do pass under it every time I take the City Cat ferry into the city. Every city has its iconic bridge. 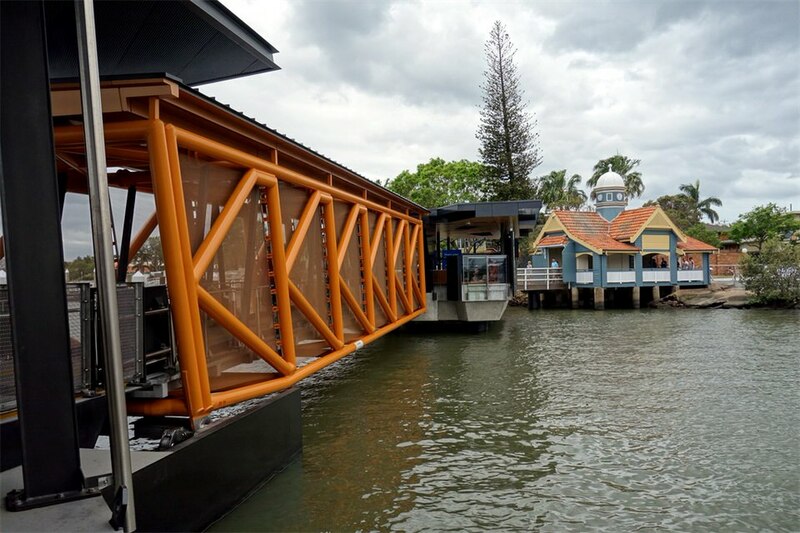 Sydney has the Sydney Harbour Bridge and Brisbane has the Story Bridge. It is said to be modeled after the Cartier Bridge in Montreal. 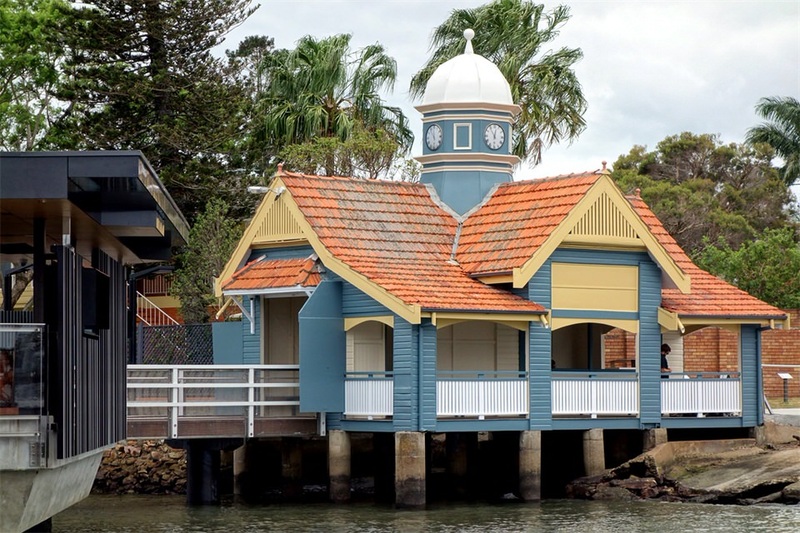 So how is that for a connection between Canada and Brisbane, Australia (that is, aside from the Klettkes living here.) 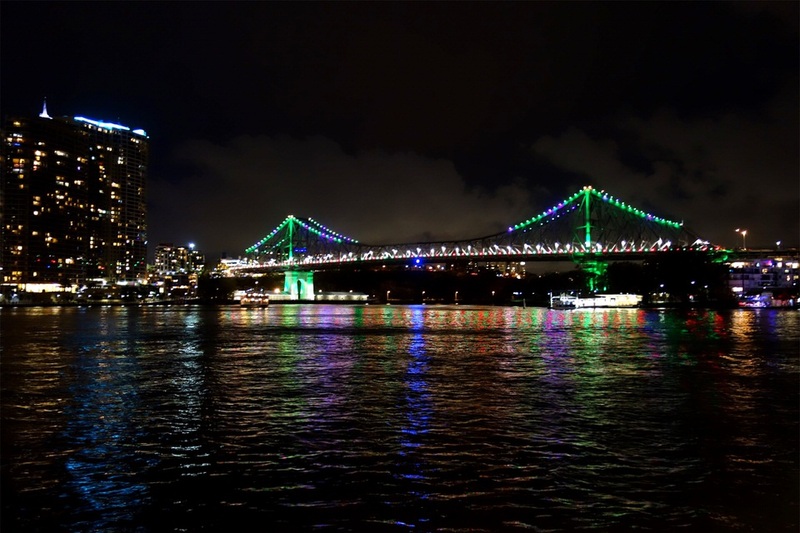 At night, the bridge is lit up with lights. 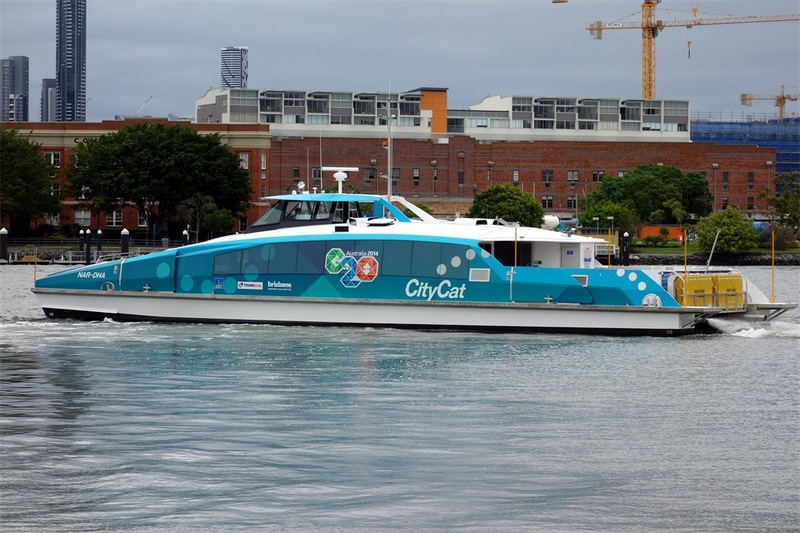 As mentioned in previous posts, the City Cat Ferry is an important part of the transportation system. We use “Go Cards” to tap on and off of the integrated ferry, bus, and train system. It is as simple as tapping on and off when entering and exiting any of these transportation modes, and there is a 2 hour continuation allowed. 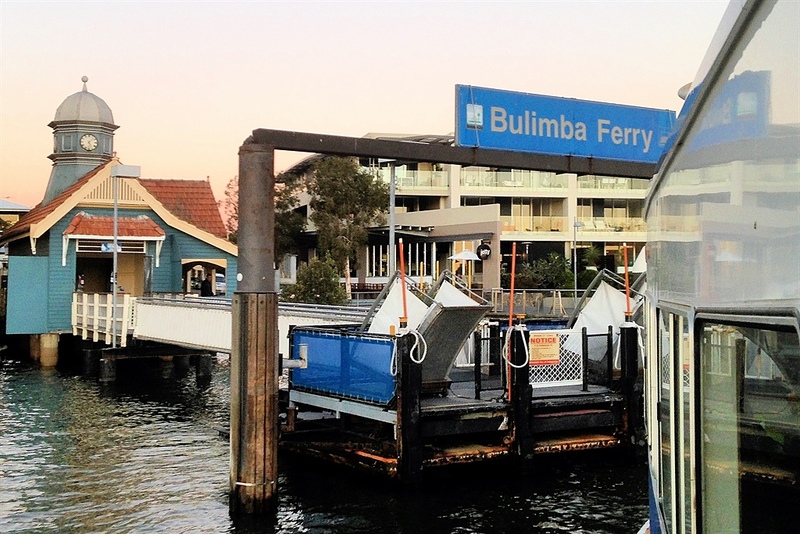 In recent years the city has allocated funds to upgrade the ferry terminals, our Bulimba ferry stop being one of them. Here are some pics taken when we went to the grand re-opening. First is a picture of the old terminal. Then, you can see the old terminal building with the new large covered walkway. There is a very precise protocol at these ferry stations, particularly during peak hours when hundreds of people board the boats. It is amusing to see the difference on the weekends when people ignore the arrow and wait line markings to mill around, effectively jumping the queue. You might notice from some of the pictures that the water in this river is not blue, but brown. This river was not always so polluted. Up until the 1920’s it was a clear water (reported to be clear to 5-6 metres below the surface), enjoyed by all for swimming, fishing, and the beautiful natural habitat of trees surrounding the river. But man’s interference, including dredging for sand and gravel for over a century, and the logging of timber along the river, as well as other factors of abuse, have left the river so polluted and full of sediment that you would not want to step into the water. If that is not enough to deter you, you would be deterred by the knowledge that you could be attacked by aggressive bull sharks, which inhabit these waters and grow to lengths of up to 3 meters. 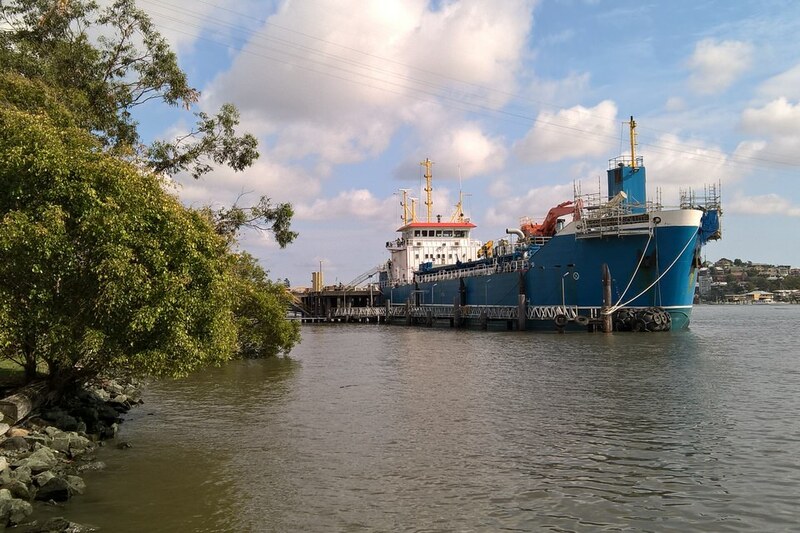 Across the river from us there still is a sand/gravel company and therefore freighters. 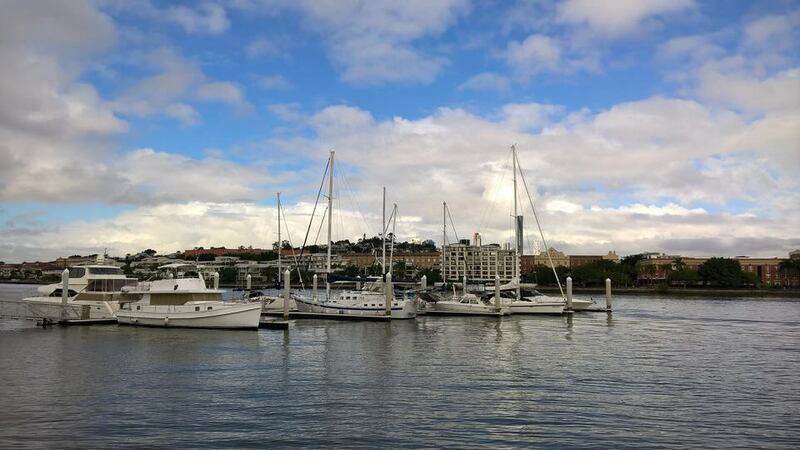 You will also find the free City Hopper ferry that navigates the river close to the CBD, the paddle wheeler (now restaurant), as well as sundry party and tourist boats, commercial boats, fishing boats, and the occasional unique scow. 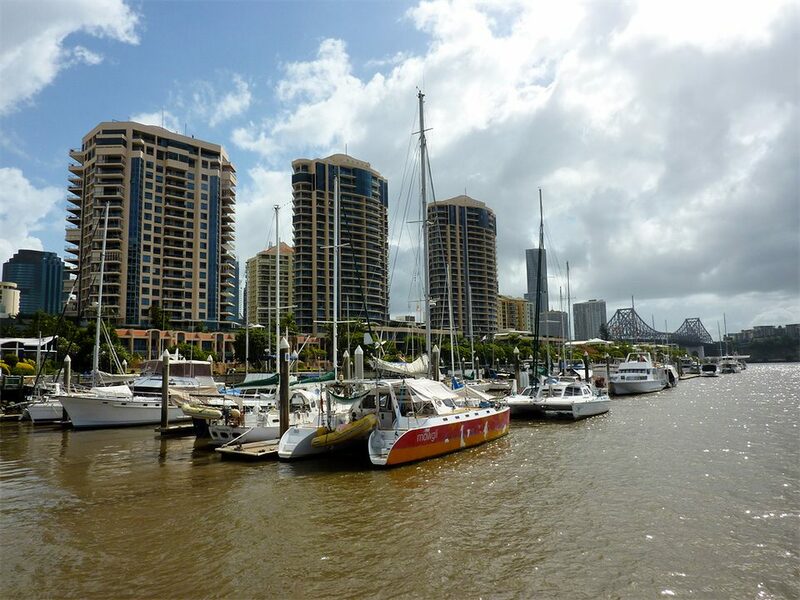 Real estate is more expensive along the water and you will note that there are a few docks for private boats and yachts. 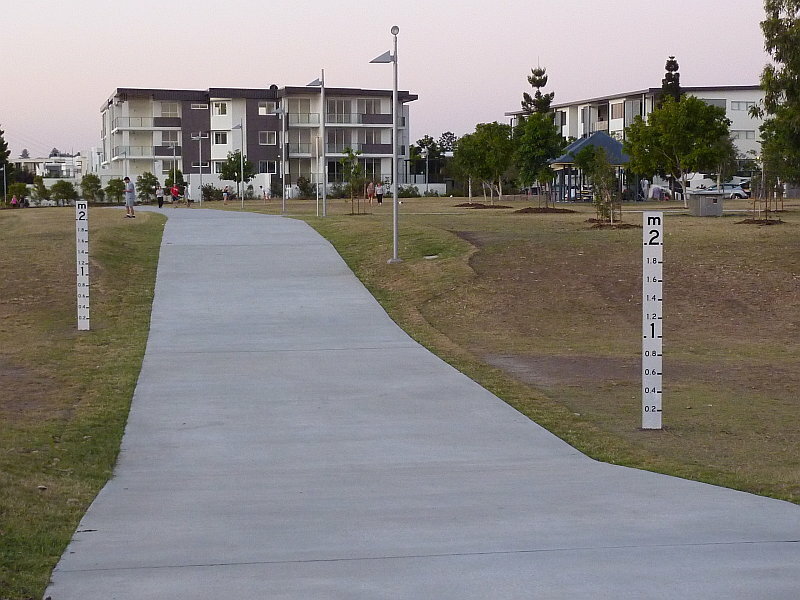 The first picture is one that was built in our neighborhood during the time that I was there. There is always the threat of severe flooding. At the end of the park between our apartment and the river, you will see a water level marker. 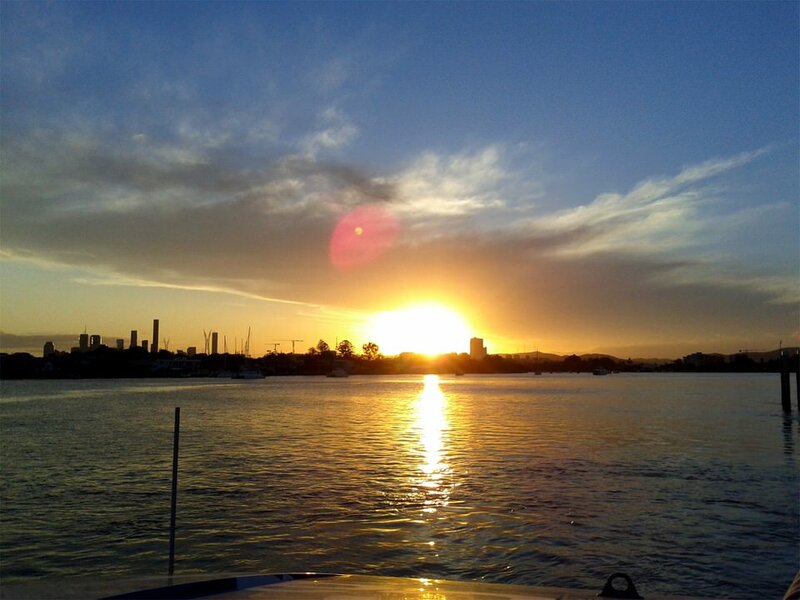 Taking our visitors aboard the City Cat for a little sightseeing is a must as there is a of interesting things to see along the water and places to go, but sometimes Ed and I go out on a nice day to catch a breeze and enjoy the sun, or later in the day, a sunset. The sky along the water is endlessly fascinating. 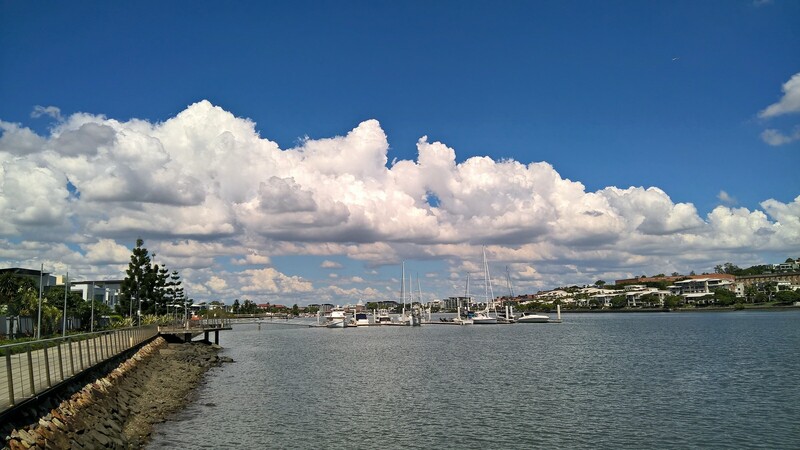 Several times we have enjoyed looking at the marvelous cloud banks that build along the water. 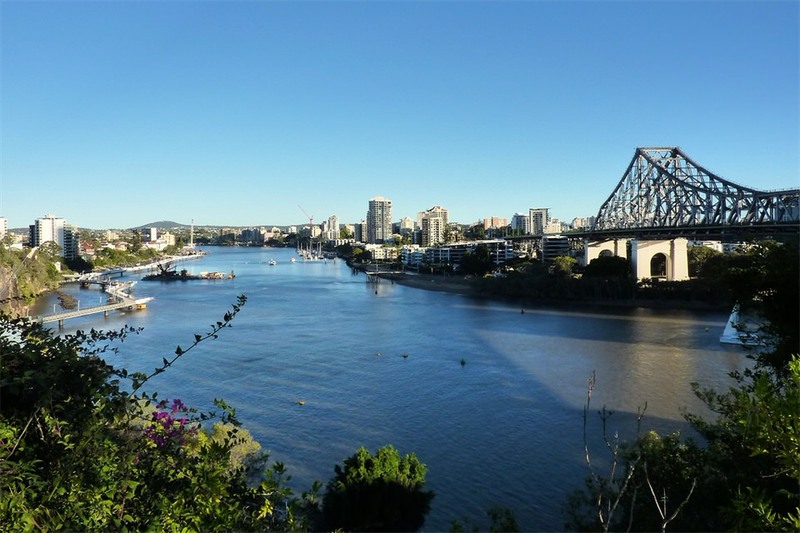 This entry was posted in Our Brisbane Life and tagged Brisbane River, Bulimba Ferry Terminal, City Cat, Kurilpa Bridge, Merivale Bridge, Port of Brisbane, Story Bridge, William Joly Bridge. Bookmark the permalink.